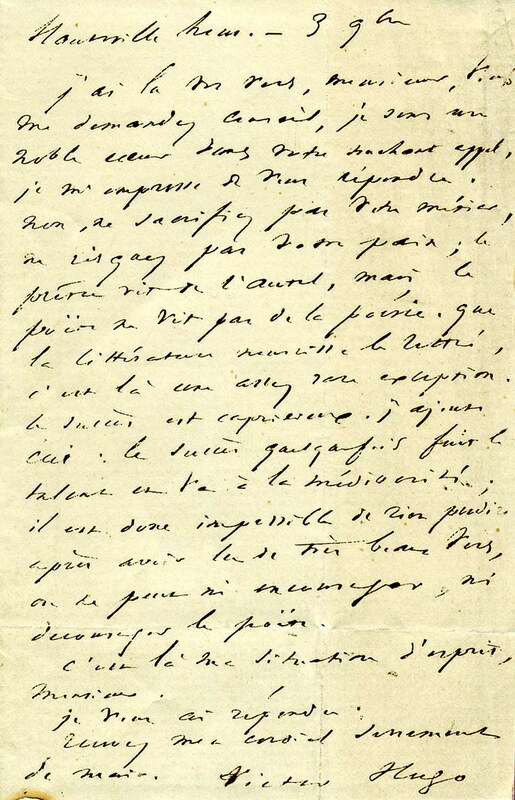 A handwritten note from Victor Hugo was found in a French edition of his book “Hunchback of Notre Dame”. Uclue customer binder123 wondered what Victor Hugo was writing about, but the author’s scrawl was hard to make out, and he had used antiquated spellings and letterforms. 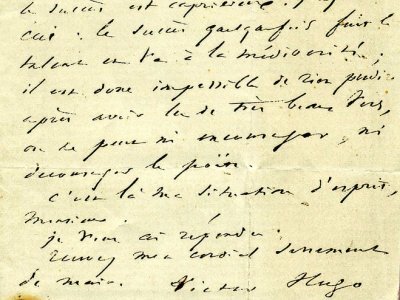 Researcher scriptor managed to decipher most of the text, and uncovered a touching letter written by Hugo to an aspiring poet who had sent a sample of his work and sought his advice. Hugo replied that the hopeful should not give up his day job, because “success sometimes avoids the talent and goes to the mediocrity”. I read your poem, Monsieur, you asked me for advice, I sense a noble heart in your ___ plea, I strive to answer you. No, do not sacrifice your profession, do not hazard your peace; the priest lives on the altar, but the poet does not live on poetry. That literature requires the literate, ___ without exception. Success is capricious. I add this: success sometimes avoids the talent and goes to the mediocrity; thus it is impossible to predict anything. After having read a very beautiful poem, one must neither encourage nor discourage the poet. That is my disposition, Monsieur. Recieve my cordial sentiment of ___. It’s amazing (and fabulous) that something like this can come to the public eye for the first time, 145 years later. It’s a lovely insight into Victor Hugo the person. For further details, see Victor Hugo Note Translation at Uclue. If you don’t know the poet and author Victor Hugo, see his entry at Wikipedia. This entry was posted on Monday, October 15th, 2007 at 3:36 pm	by eiffel	and is filed under Discoveries. You can follow any responses to this entry through the RSS 2.0 feed. Both comments and pings are currently closed.